I read this article and found it very interesting, thought it might be something for you. 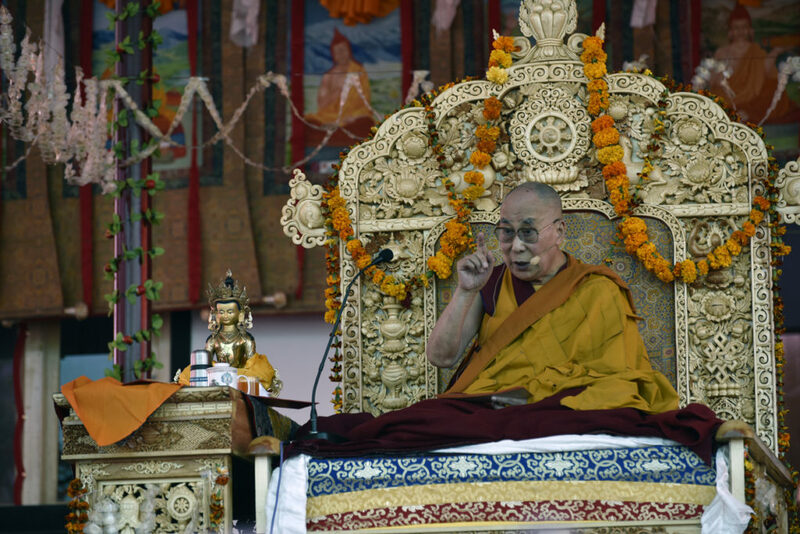 The article is called His Holiness The Dalai Lama Begins Teaching at Samstanling Monastery and is located at https://tibet.net/2018/07/his-holiness-the-dalai-lama-begins-teaching-at-samstanling-monastery/. 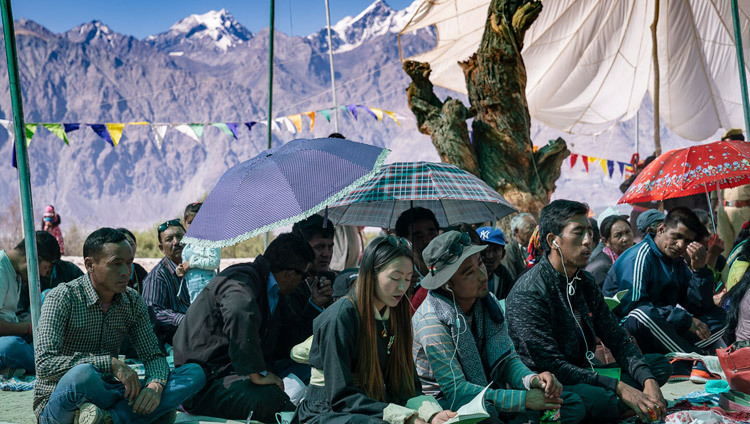 Sumur, Nubra Valley, Ladakh, J&K, India – Monks were engaged in a vigorous debate when His Holiness the Dalai Lama reached the stage at the top of the Samstanling teaching ground today. He saluted the crowd, greeted Lamas and dignitaries as usual and took his seat. The chant-master began the introductory prayers while tea and bread were served. “Today, I’m going to give a discourse on the teachings of the Buddha,” His Holiness announced, “so we’ve begun by reciting the ‘Three Continuums’ and the ‘Heart Sutra’. The first can be found in Pali and Sanskrit editions, but the ‘Heart Sutra’ derives from the Sanskrit Tradition. We also say the verses of homage from Nagarjuna’s ‘Fundamental Wisdom of the Middle Way’ and ‘Ornament for Clear Realization’. “During a recent meeting between Tibetan and Theravada scholars I posed a question. The Buddha taught 2500 years ago. Since then many things, such as the clothes we wear, our houses, our modes of transport, have changed significantly. So we have to ask, is the teaching of the Buddha still relevant today? We shouldn’t follow it just because we’ve become accustomed to doing so. “I have many Christian, Muslim, Hindu friends whose faith has brought them benefit. All of these traditions teach the importance of love and compassion—concern for others. When human beings face difficulties, faith in God can help keep hope alive. “In his first series of teachings, which we call the first turning of the wheel of dharma, traditionally preserved in Pali, the Buddha explained the Four Noble Truths and their sixteen attributes. In the second series, recorded in Sanskrit, he taught about emptiness. Whereas the Pali Tradition relies primarily on scriptural authority, the Sanskrit Tradition, exemplified by Nagarjuna and his followers, relies on reason. What Dignaga and Dharmakirti have written about logic equips us to extend our range of knowledge beyond empirical perception. The psychology we can find in the works of the 17 Nalanda Masters means the teachings of the Buddha are not merely relevant, but necessary in this 21st century. His Holiness observed that more than ten years ago he suggested that Tibetan monasteries introduce science to their curriculums. They did and one result is that some of them now have science labs on their premises. In the past, there were monasteries and nunneries that only engaged in ritual activities, having no model for how to study and learn. This has changed and nowadays even lay-people are taking interest in learning. His Holiness remarked that Haribhadra’s ‘Clear Meaning’, one of the 21 treatises on the ‘Ornament for Clear Realization’, distinguishes two types of Buddhist followers: those of sharp faculties who follow reason, and those with duller faculties who depend on faith. Before beginning to read Je Tsongkhapa’s ‘Three Principal Aspects of the Path’, His Holiness was lavish in his praise. He described him as extremely learned, someone who practised the Dharma day and night. To compose his commentary on ‘Ornament for Clear Realization’, he read all 21 existing treatises by Indian masters before composing his own interpretation. His Holiness compared the original thought of the ‘Golden Garland of Good Explanation’ to a text by Buton Rinpoche, often referred to as ‘omniscient’, that comments on a work by Nagarjuna on Guhyasamaja, but which tends only to paraphrase the words of the Indian master. Tsongkhapa, on the other hand, goes out of his way to clarify difficult points. His Holiness remarked that Tsongkhapa’s mastery was such that the noted scholar-adept Trehor Kyörpön encouraged him to study all five of Je Rinpoche’s works on Madhyamaka, the gist of which is that things exist merely by way of designation. His Holiness speculates that if he had been following his own point of view, Tsongkhapa might have begun the ‘Great Stages of the Path’ with the Four Noble Truths. However, he was instead following the tradition set by the Kadampas. Reading a book by Khedrup-jey, one of Tsongkhapa’s two principal disciples, His Holiness was surprised that he used rough language in his criticism of others—not something Je Rinpoche ever does in his writings. Tsako Ngawang Drakpa, another of Tsongkhapa’s disciples, had been despatched to Eastern Tibet to teach. From there he put questions to his master in a letter, to which ‘Three Principal Aspects of the Path’ is the reply. Elsewhere, Je Rinpoche wrote that when he eventually manifests Buddhahood in the world, he will share his first teaching with this disciple. His Holiness touched on the imminence of death, the fact that friends, wealth and fame will be of no help. His allusion to the subtlest consciousness prompted him to talk about practitioners who remain in meditative absorption after clinical death—a phenomenon interested scientists are beginning to investigate. Reaching the verses dealing with the second of the principal aspects of the path, generating the awakening mind of bodhicitta, His Holiness indicated what a powerful impetus they can also be to the determination to be free. Written as related to our mothers, other sentient beings, they can also apply to us. All beings, your mothers, are in this condition. Think of them and generate the mind of enlightenment. Even in cyclic existence, I shall have no joy. represent the view that asserts that things exist merely by way of designation. His Holiness quoted the 1st Dalai Lama, Gendun Drup’s declaration that he had forsaken solitude to better work for the benefit of living beings. Echoing this sentiment, His Holiness remarked that he has dedicated his body, speech and mind to the welfare of others and is guided by another of Shantideva’s verses. Therefore, inspire me to rejoice when others are happy. And destroy this monstrous demon of selfishness. Is the gateway to infinite virtue. Even should they rise up as my enemies. While Buddhas work solely for others. May I be inspired to be able to exchange myself for others. The yoga of exchanging myself for others. His Holiness emphasised that we are all equal in desiring happiness and not wanting to suffer. What’s more, sentient beings have been kind to us in the past, as they are now. Even the attainment of liberation is due to the kindness of sentient beings. Compared to the chronic disease of the self-cherishing attitude that is the source of all suffering, bodhicitta is the source of all qualities—the tree that shelters all beings wandering and tired on the path of conditioned existence, the dawning moon of the mind that dispels the torment of disturbing conceptions, the great sun that finally removes the misty ignorance of the world, and the quintessential butter from the churning of the milk of Dharma. Finally, His Holiness mentioned that in conversation with Ganden Trisur Rinpoche he had been reminded that the 2nd Dalai Lama, Gendun Gyatso, composed a commentary to the classic text, the Manjushri-nama-samgiti or ‘Chanting the Names of Manjushri’. The commentary is uncommon among Geluk transmissions, but he received it from Dilgo Khyentse Rinpoche, who had been given it by Jamyang Khyentse Wangpo. Today, His Holiness gave a reading transmission of the root text that monks commonly memorize. 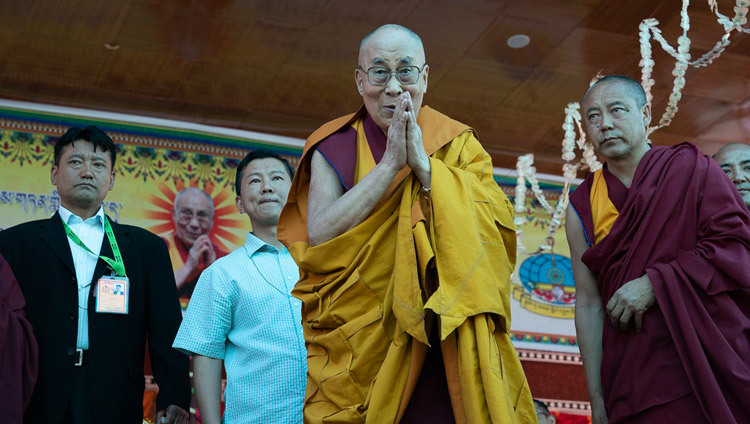 When he reached the end he announced that tomorrow he would give a Longevity Empowerment, which will be followed by prayers and offerings for His Holiness’s long life.